Traditional Reclaimed Materials, with decades of experience, has a well deserved national reputation for providing the very finest reclaimed architectural salvge materials and reproductions. 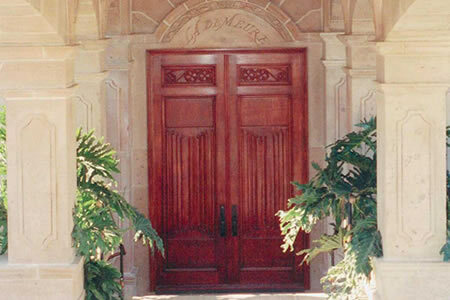 We offer a fine selection of antique wood, recyled, and reclaimed doors at various price levels. 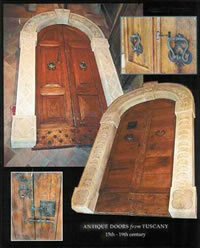 We offer the finest door reproductions based on client's needs and requirements. Our stock of wood doors come in almost all wood species including oak, walnut, cherry, pine, fir, teak and chestnut. There is a large selection of custom antique doors, antique wood doors, solid wood doors, carved antique doors, design doors, antique double doors, and eliptical straight top doors and iron gates. All our materials are made from reclaimed woods and are environmental friendly. We also provide a wide selection of reproduced hardward for our doors. Wooden doors can be assembled with matching wood jambs per cleint's specifications and are ready to be installed. © Traditional Materials -Reclaimed architectural elements architectural salvage. Leader in supplying wholesale reclaimed floors, green build and flooring.reclaimed wood beams, roofing, garden elements, fireplaces, antique fountains, terra cotta roofing, and terra cotta flooring. We carry a vast selection of reclaimed cobblestones and reused bricks, antique wood doors, limestone, limestone flooring, antique wood beams, marble and more! Unique garden and landscaping design ideas with formal or antique garden pots, planters and large urns that will add color and dimension to your home.